With a design that is defined by its more earthy and gritty appeal, Hamilton returns to a more vintage design sensibility with this watch from the Khaki Field series, featuring a rugged olive-green strap and hour markers that also cover the 24 hour markers. With a mechanical movement, 42 hour power reserve and water resistance of up to 50m, enjoy this timepiece that is marked for people with the love of the outdoors. Hamilton watches are all about quality, technology and design and are some of the finest watches in the world. 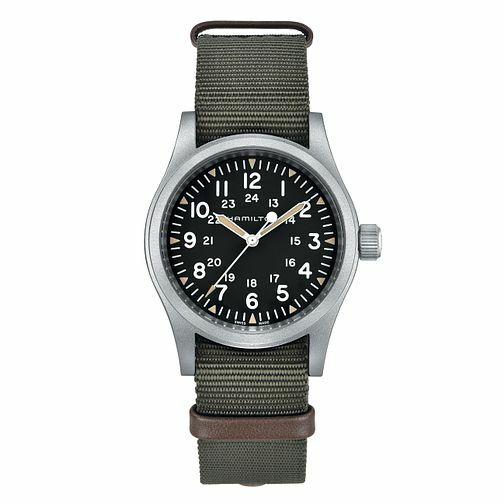 Hamilton Khaki Field Mechanical Men's Green Strap Watch is rated 5.0 out of 5 by 3. Rated 5 out of 5 by Anonymous from Excellent Extremely happy with the watch and a must have in any watch collection. Rated 5 out of 5 by Anonymous from Good Value Hamilton Field Watch This new iteration of the Hamilton Khaki Mechanical is almost a straight copy of the watches Hamilton made for the military post WW2. It looks good on the wrist. The strap is very good quality and goes well with the watch. A good buy if you want a robust hand winding watch.